When the U.S. military is using equipment out in the field, safety and efficiency are top priorities. 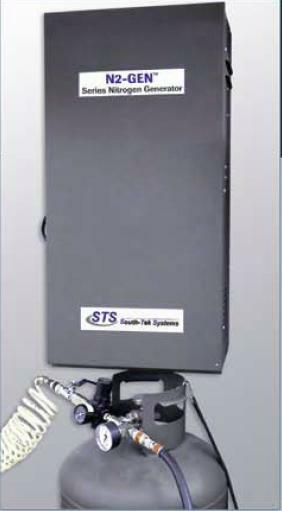 That's why South-Tek Systems is pleased to offer a line of small and portable Nitrogen Generators specifically designed for use in field labs, Humvee mounted optical labs, and mobile maintenance trailers. The military EMIP review is a rigorous and competitive process. Only a dozen technologies a year are selected for review, which is why South-Tek Systems is tremendously proud of the N2 GEN. The N2 GEN Series Nitrogen Generator allows U.S. military fighters the capability of producing safe, inert Nitrogen gas on demand. An element critical to maintenance in the field or at the maintenance facility, Nitrogen gas can be used in a variety of field applications. This versatility, coupled with the low-hazard characteristics make Nitrogen gas an effective and reliable resource. Furthermore, the N2 GEN eliminates the safety and logistical risks involved with transporting high pressure gas cylinders. The ability to produce Nitrogen from the surrounding air is what makes the N2 GEN system an invaluable technology for work in war or occupation scenarios. It also provides an added level of safety for military fleets, reducing non-combat casualties caused by transporting high-pressure cylinders of compressed Nitrogen to maintenance sites. The N2 GEN also addresses the issue of reliability/maintainability/sustainability by reducing paperwork for operators and eliminating the need to transport gas cylinders or arms to and from maintenance depots and sites. This allows the entire operation to work effectively, efficiently and with as much safety as possible. And, due to the small, portable design, the N2 GEN allows for on demand Nitrogen without taking up valuable space or becoming a cumbersome piece of equipment. For more information on the N2 GEN Nitrogen Generator from South-Tek Systems, check out the product page online or contact one of our Nitrogen Generation experts by calling toll free at (888) 526-6284.